We just got his handheld wireless milk frother and we love it!! My husband and I are big fans of going to coffee shops however they can get really expensive so sometimes it’s nice to just make some at home. With the 1 Easy Life handheld wireless milk frother we can make coffee house style drinks in the comfort of our own home really easily!! 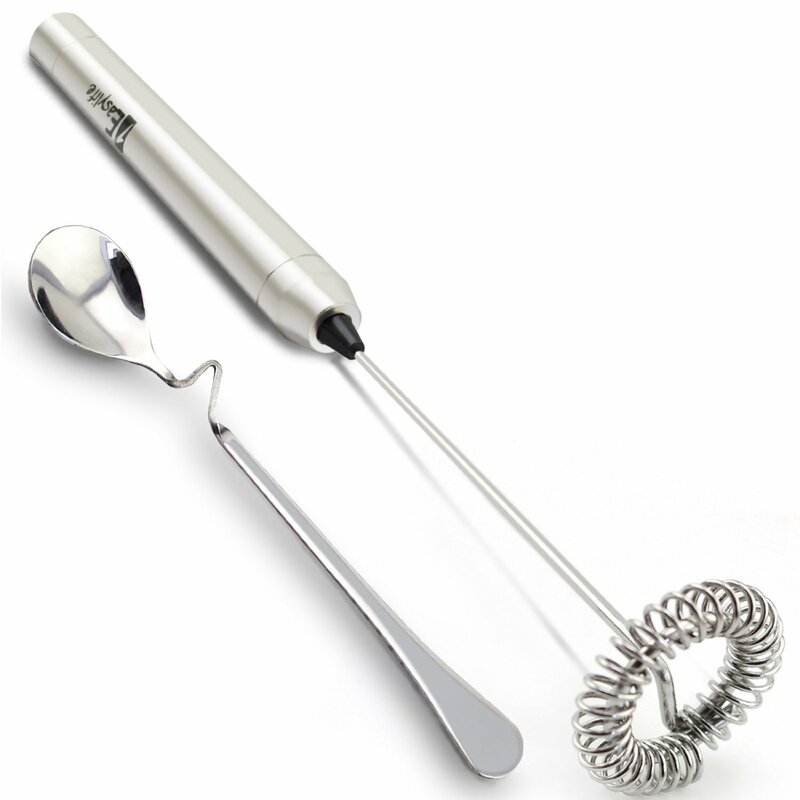 The frother is very lightweight and easy to use. It whips up gourmet style froth in minutes for not only coffee but lattes, cappucinos, hot chocolates, and more! It’s small enough that it stores easily and doesn’t take up much space. Only has one speed. It requires 2 AA batteries that are not included. It also comes with a really neat silver steel spoon. It has a really neat design that makes it really unique and allows you to rest it on the side of the coffee cup which is nice. Very durable and easy to use. ★ 1Easylife MILK FROTHER, PRIDE AND BARISTAS SECRET WEAPON offers you the professional finishing touch for your lattes, cappuccinos, hot chocolates or chilled milkshake. The fresh and fast froth is now a reality in your kitchen’s very own coffee shop – hot or cold, frothy or smooth. It can even bring an indulgent twist to everyday instant coffee. Flawless in form and function 1easylife Milk Frother can be taken straight to the table. ★ SUPER-EASY TO CLEAN DESIGN & CONSTRUCTION: The sleek body of the frother is also worth highlighting, making it compact. It is also lightweight, which means that you do not have to sweat in using such, Cleaning will be a snap just placing the rod under the running water to rins (no immersion of the handle), means that minimal effort will be required on your part to maintain its best quality and functionality even through the years. ★ EASY TO OPERATE USING AN ON/OFF SINGLE BUTTON: 1Easylife deluxe stainless steel milk frothers wand do a very good job by depressing the button it will give you an amazing froth, with very little effort. It takes about 20-30 seconds of pumping action. Battery operated frothers generally aerate by rotating a whisk-like rod (and can also be used for light egg beating eggs and for mixing drinks), it is a convenient method of frothing right in the cup or other container. ★ A MUSTHAVE KITCHEN TOOL & THE GOOD OFFER YOU CAN FIND. It comes with a LIFE TIME WARRANTY against any factory defects. Another good thing is that it comes with an 1Easylife Exclusive Coffee Recipes eBook that will provide you with ideas on how to prepare different coffee drinks with the use of the frother. The comprehensive instructions provided will definitely be a snap to follow. You can purchase this milk frother on Amazon!